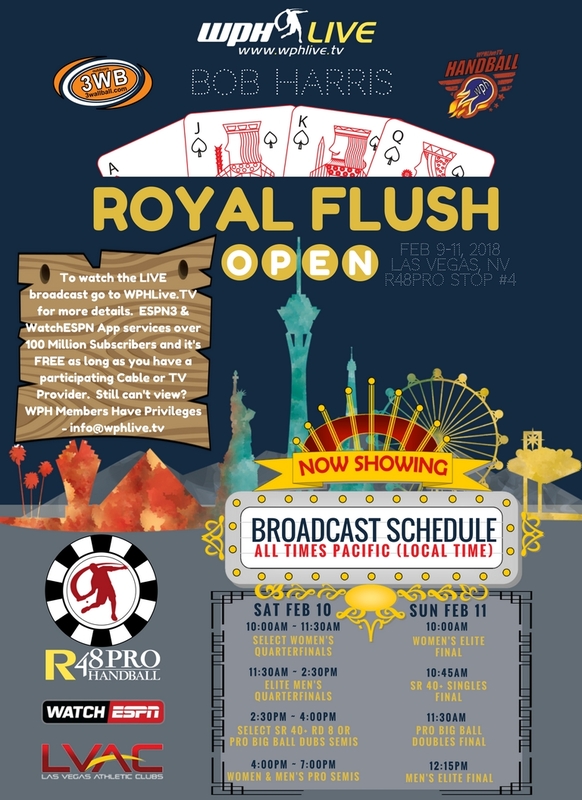 R48Pro Men, Women, Sr 40+ in Vegas Feb 9th!!! Rules: All divisions will follow the USHA Rules; except where modified for TV/ESPN – All Children under the age of 14 will not be allowed into the club. No outside food or beverage allowed in the club. The LVAC is a full service venue that has food and drink inside the facility. Eyeguards are mandatory for all court use; regardless of whether it’s a tournament match or practice. First time offense is removal from the facility. video replay, the player must request a video replay after the rally and specify what is being challenged (short serve, server can appeal on a foot fault call against him/her immediately but not after the rally. forfeited as a result; If you are scheduled to play a match on the broadcast, it must be played at the time scheduled. We book certain matches for the broadcast and those matches are cleared and promoted by ESPN and we need to have the match played for the time slot we select. All unauthorized matches will not count and will be forfeited. We apologize for this inconvenience.